The non-core Caryophyllales clade (sensu Cuénoud et al. 2002), which corresponds to the Polygonales of Judd et al. (2002), has only recently been identified through molecular phylogenetic analysis. It includes several families that were previously classified in Cronquist’s (1981) Rosidae or Dilleniidae. Possible synapomorphies for the non-core Caryophyllales (= Polygonales sensu Judd et al. 2002) are scattered secretory cells containing plumbagin, naphthaquinone (which has been lost in several clades), an indumentum of stalked, gland-headed hairs, basal placentation (with shifts to parietal in some Droseraceae and axile in Nepenthaceae), and starchy endosperm (Judd et al. 2002). 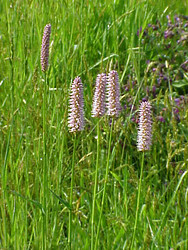 Polygonaceae and Plumbaginaceae are united by ovaries with a single ovule and generally indehiscent fruits such as achenes or nuts. The clade of Droseraceae, Nepenthaceae, and relatives is probably supported by carnivory, circinate leaves, and pollen grains in tetrads (Judd et al. 2002). Polygonaceae (43 genera, 1,100 species; cosmopolitan) and Plumbaginaceae (22 genera, 800 species; cosmopolitan, but centered in the Mediterranean region) form a strongly supported clade, as they have in many previous analyses (e.g., Giannasi et al. 1992; Rettig et al. 1992). 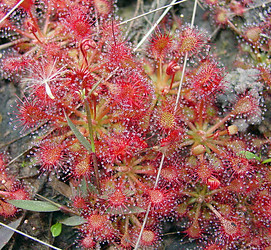 Carnivorous plants classified in Droseraceae (3 genera; 115 species; cosmopolitan), Drosophyllaceae (monospecific; Spain and Morocco), Dioncophyllaceae (3 monospecific genera; western Africa), and Nepenthaceae (monogeneric with 90 species; Madagascar to New Caledonia), together with Ancistrocladaceae (monogeneric with 12 species; tropical Africa to Borneo and Taiwan). The relationship between Droseraceae and Nepenthaceae, and their relationship to Caryophyllidae sensu Cronquist (1981), was first recognized on the basis of rbcL sequences (Albert et al. 1992; Chase et al. 1993; Williams et al. 1994). 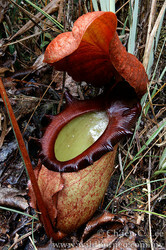 Analyses of matK sequences alone for several species of Nepenthes, Drosera, and Ancistrocladus, plus Drosophyllum and all three genera of Dioncophyllaceae, resulted in a well-supported tree with Droseraceae sister to a clade of Nepenthaceae , (Drosophyllum , (Dioncophyllaceae , Ancistrocladaceae)) (Meimberg et al. 2000). Albert, V. A., S. E. Williams, and M. W. Chase. 1992. Carnivorous plants: phylogeny and structural evolution. Science 257:1491-1495. Chase, M., Soltis, D. and R. E. A. Olmstead. 1993. Phylogenetics of seed plants: an anlysis of nucleotide sequences from the plastid gene rbcL. Ann. Miss. Bot. Gard. 80: 526-580. Cronquist. 1981. An integrated system of classification of flowering plants. Columbia University Press, New York. Giannasi, D. E., Zurawski, G., Learn, G. and M. T. Clegg. 1992. Evolutionary relationships of the Caryophyllidae based on comparative rbcL sequences. Systematic Botany 17: 1-15. Judd, W. S., Campbell, C. S., Kellogg, E. A. and P. F. Stevens. 2002. Plant systematics: a phylogenetic approach. Sinauer Associates, Inc., Sunderland, Massachusetts. Meimberg, H., P. Dittrich, G. Bringmann, J. Schlauer, and G. Heubl. 2000. Molecular phylogeny of Caryophyllidae s. l. based on matK sequences with special emphasis on carnivorous taxa. Plant Biology 2:218-228. Rettig, J. H., Wilson, H. D. and J. M. Manhart. 1992. Phylogeny of the Caryophyllales--Gene sequence data. Taxon 41: 201-209. Williams, S., Albert, V., and M. Chase. 1994. Relationships of Droseraceae: a cladistic analysis of rbcL sequence and morphological data. American Journal of Botany 81: 1027-1037. Page: Tree of Life non-core Caryophyllales. Polygonales. Authored by Pam Soltis, Doug Soltis, and Monica Arakaki. The TEXT of this page is licensed under the Creative Commons Attribution License - Version 3.0. Note that images and other media featured on this page are each governed by their own license, and they may or may not be available for reuse. Click on an image or a media link to access the media data window, which provides the relevant licensing information. For the general terms and conditions of ToL material reuse and redistribution, please see the Tree of Life Copyright Policies.